What is a croquant chou? It comes from the words croquant and choux. Croquant is French for ‘crisp’, and croquant is a crispy pastry or coating, often made from nuts or toffee. Choux is the pastry used for treats such as cream puffs and eclairs. In Japan, choux means ‘cream puff’. 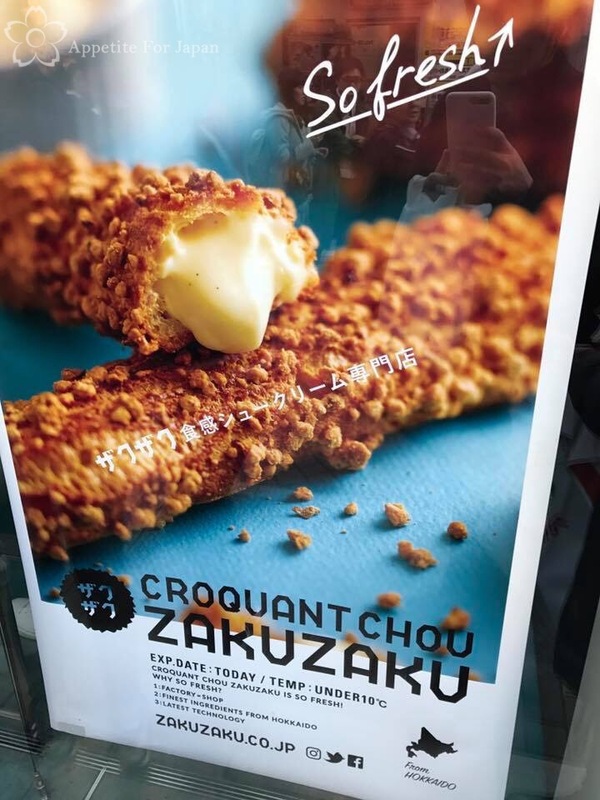 Yep, you guessed it: croquant chou means ‘crispy cream puff’, and that’s exactly what they specialise in at Zaku Zaku! And in case you’re wondering, ‘zaku zaku’ means crunchy. Crunchy, crispy cream puffs. 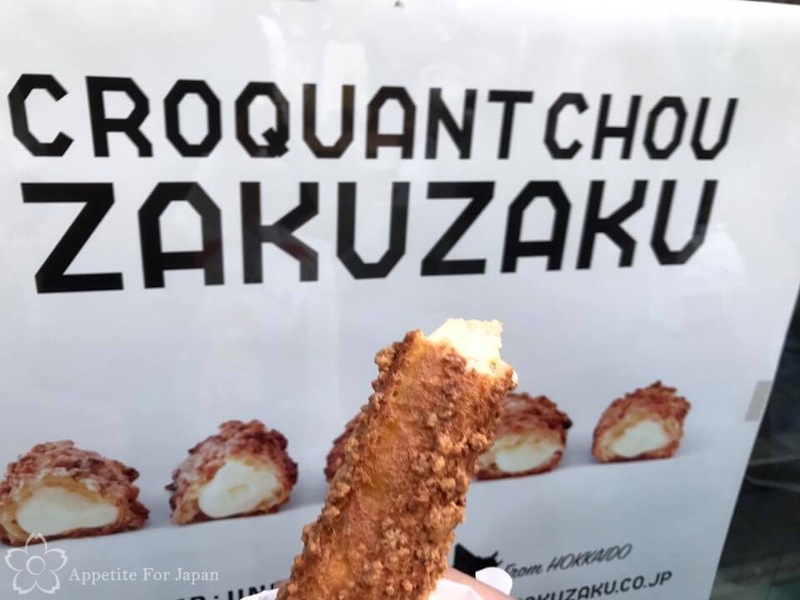 The croquant used at Zaku Zaku is made of almonds coated with sugar and egg white, as well as a blend of flour from Hokkaido, and the cream filling is made from fresh milk. 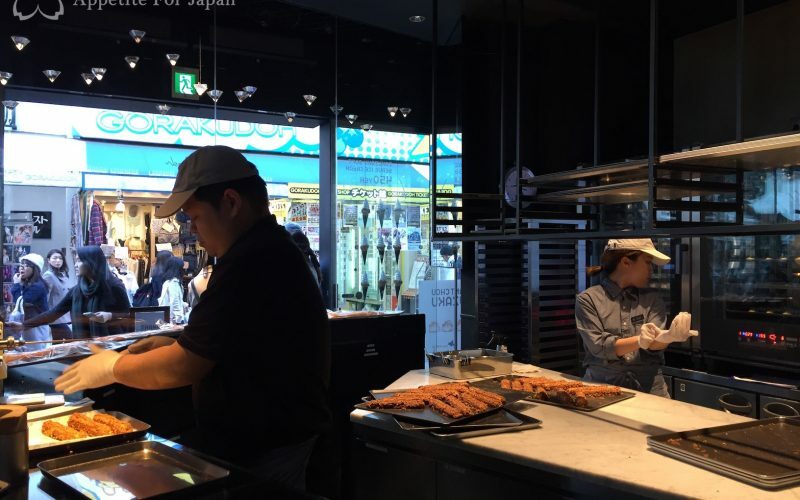 Zaku Zaku’s croquant chou pastries are made fresh and sold almost as soon as they’re ready. You can watch the staff making and filling the pastries while you wait. Oh yes, and you can expect to wait! 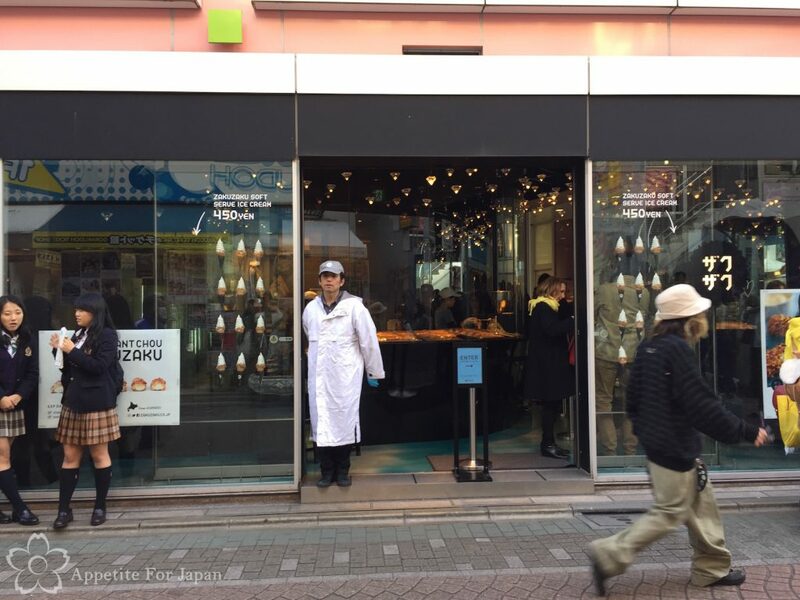 Harajuku’s Takeshita Dori (Takeshita Street) is a very vibrant and happening area and is always, always crowded, and Zaku Zaku is very popular, so you can expect to queue up for your croquant chou. The line moves fairly steadily, at least, and your croquant chou will be pretty fresh. Because they’re made with fresh dairy ingredients, you have to keep them cool and consume them the same day. Most people eat them straight away. In addition to the very popular croquant chou, Zaku Zaku also sells soft serve ice-creams with almond crunch (the same crunchy croquant used in the pastries). These are available in a cone or a cup. 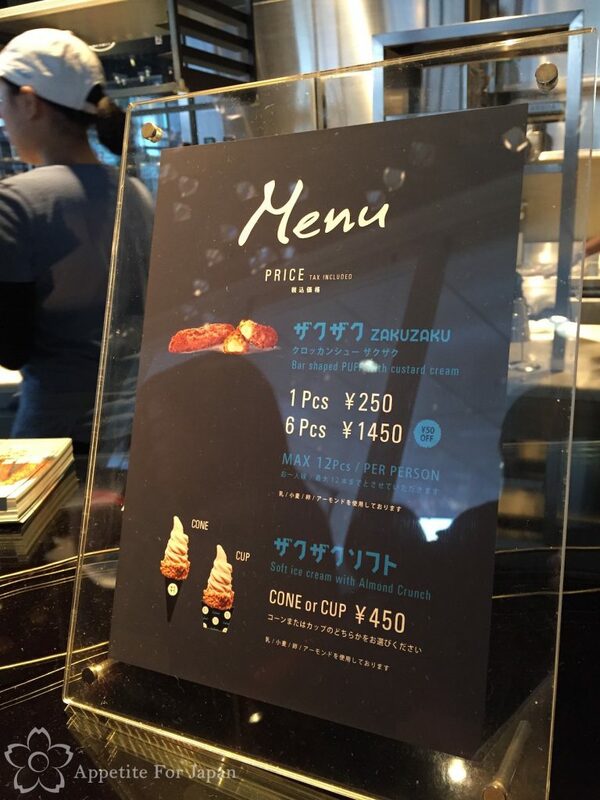 How much does a soft serve of croquant chou at Zaku Zaku cost? 1 croquant chou costs 250 Yen, or you can buy 6 for 1,450 Yen (but make sure you keep them cool and eat them the same day!). 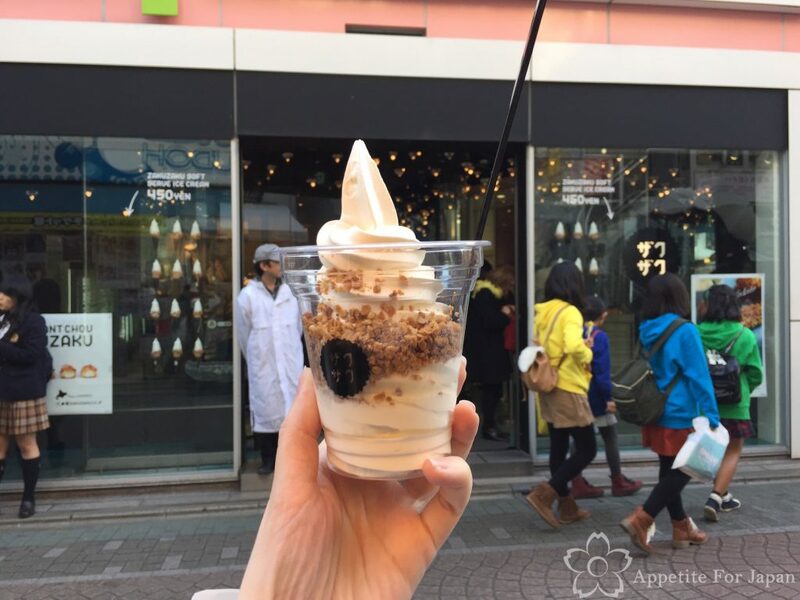 Soft-serve ice-cream costs 450 Yen for a cone or cup. My partner tried the croquant chou (pictured above – apologies for the blurry photo! ), which he enjoyed. He did note that because there was so much hype around the Zaku Zaku croquant chou, he was expecting it to be even better than it was. Nonetheless, he did quite like it. I tried the soft-serve with almond crunch in a cup. 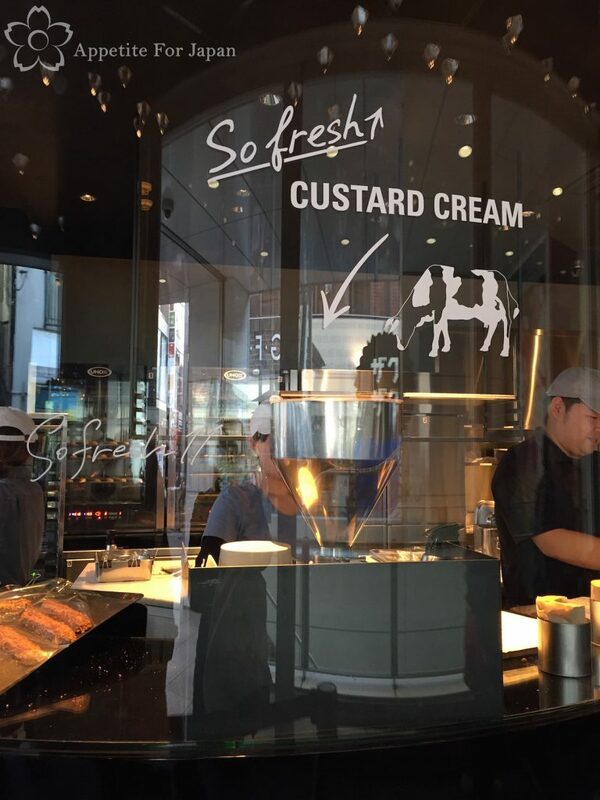 Having had Hokkaido soft serve in the past, this is what I was expecting. Alas, I’d got my hopes up for nothing, as this was just normal ‘milk’ flavoured soft-serve, as opposed to the incredibly tasty Hokkaido milk flavour. Nothing wrong with it, but just not what I was hoping for. As I mentioned, most people eat their croquant chou straight away. 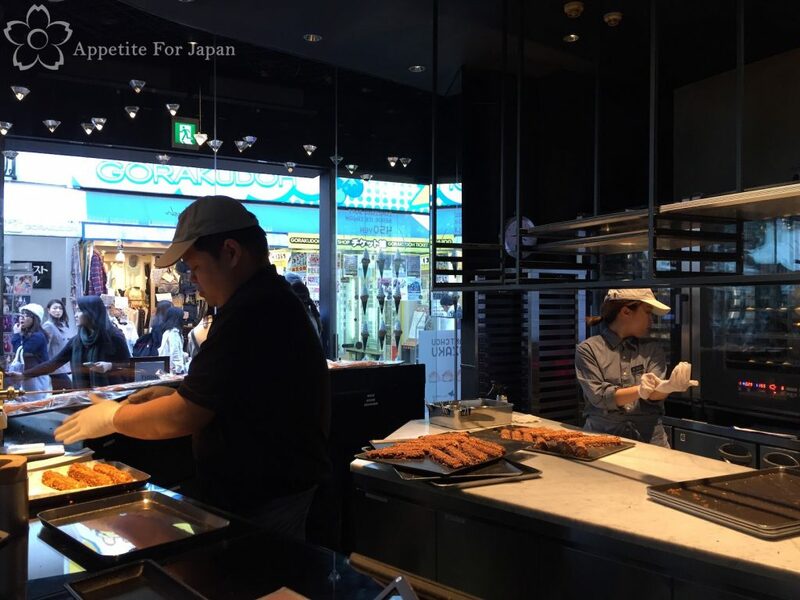 It’s considered rude to eat whilst walking in Japan, so people tend to stand right outside the store, as there’s not a lot of space to stand around in Harajuku’s busy Takeshita Dori. See the man in the white coat? He was ensuring that the line for Zaku Zaku remained orderly, and that people put their rubbish in the bin (located by the door, just behind him). Would I recommend Zaku Zaku’s croquant chou? Possibly. There is a lot of hype surrounding the croquant chou, and we thought they were decent but not quite deserving of quite that much hype. 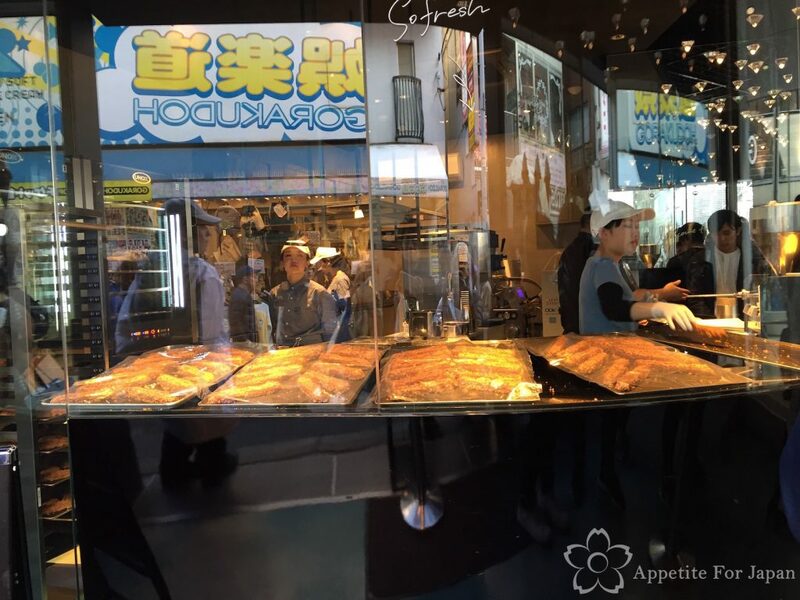 When visiting Takeshita Dori in Harajuku, bear in mind that there are a lot of snacks on offer, including lots of the very popular (and rightly so!) Japanese crepes. My advice is to try a croquant chou if a crispy cream puff sounds good to you, but make sure you leave room for other treats while you’re in Harajuku! Zaku Zaku is very easy to find, as it’s at the street level of the Cute Cube building in Harajuku’s Takeshita Dori (Takeshita Street) – that iconic street in Harajuku, full of interesting stores and lots of people. Simply exit Harajuku Station and cross the road immediately to enter Takeshita Dori, and keep an eye out on your right for the Cute Cube building, about halfway down the street. The Cute Cube building is also home to Sanrio’s Pompompurin Cafe. Zaku Zaku is mostly black with glass windows at the front. You’ll be able to see some of the croquant chou (or at least, a line of people queuing up to buy them). Other stores: There are several Zaku Zaku locations in Tokyo and beyond, including Shinjuku and Ikebukuro. You can find the list of stores on the Zaku Zaku website.